Is there a medium that artists won’t use? We’re all familiar with the usual acrylic paints, watercolors, chalk, and so on, but did you know that there are artists that are painting with fire? It cannot be easy. After all, fire is extremely unpredictable and dangerous. However, there are several artists ignoring the risks and creating stunning and unique pieces of art all created using flame. In Canada, Steven Spazuk has been painting with fire for nearly 15 years. After being inspired by a dream where he stood in a gallery with black-and-white paintings he knew were created with fire, he has been experimenting with flame and brushes made from materials like Barbie-doll hair, frayed rope, needles, and feathers. The process begins with a clean sheet of paper and a torch. 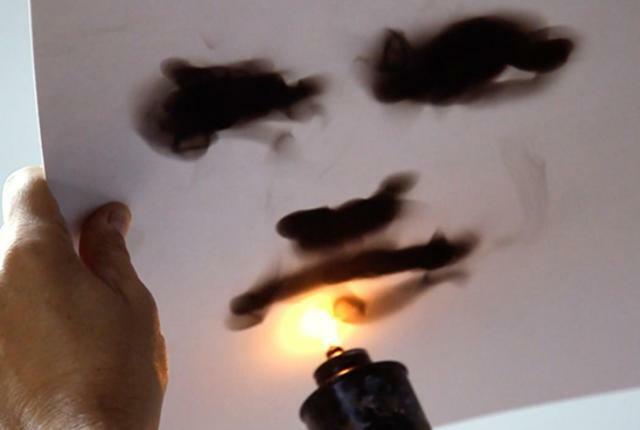 He free-paints with the flame, and then uses his brushes to create white space and images in the soot. Because the soot is so delicate, Spazuk isn’t always sure of what a painting will turn out to be. He compares it to the path of a fish in water. In West Virginia, another painter crouches next to the cinders of a giant bonfire. Pete Kephart takes a sheet of cotton paper backed with plywood and paints his images using water and soap. Other times, he uses colored paints or mud. The places on the paper where he hasn’t applied this mixture burn very quickly, creating a stunning contrast. He then holds the paper over the hot cinders, paying close attention to timing. If he makes a mistake, the paper will crumble into ash. Donna Ruff from Florida also draws with fire, using old books and other “trash” paper. She uses a painfully-slow process with multiple soldering tools to burn away areas of the paper into detailed lace-like patterns. The result is a combination of what looks like a naturally-aged piece of paper, but with such intricate designs, it’s clearly been created by a master of fire.